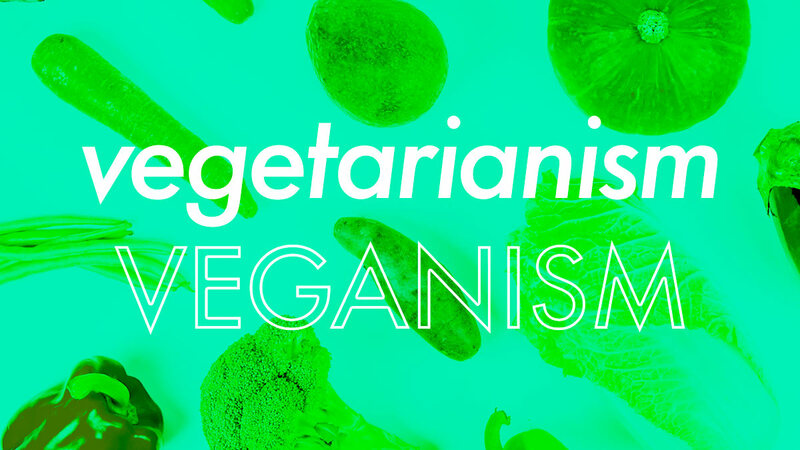 Vegetarianism vs. Veganism: What's The Difference? It’s a lot more complex than you think. With the different diets emerging and gaining popularity among millennials, vegetarianism and veganism are two that appeal the most to people who are looking to live a healthier lifestyle. People choose a vegetarian or vegan diet for many reasons. Some adopt it mainly for ethical reasons, others because of health, and environmental concerns or even religious beliefs. But whether or not you choose to make the switch, it’s important to understand the difference between the two and make sure you’re equipped with the knowledge to make the change. Many people often confuse vegetarianism and veganism as one and the same. But what most people don’t know is that veganism is actually a form of vegetarianism. While both beliefs or practices abstain from the consumption of meat, poultry, and seafood, veganism nowadays can be considered an exclusive category and can be differentiated from vegetarianism in terms of which animal-derived products are considered acceptable. What does it mean to be vegetarian? Anyone who doesn’t eat the flesh of an animal is considered a vegetarian. Under vegetarianism, are four other variations of a vegetarian diet: Lacto-Ovo Vegetarian, Lacto-Vegetarian, Ovo-Vegetarian, and Vegan. Vegetarians are more lenient when it comes to the consumption of animal by-products which is why Lacto-Ovo Vegetarians, the most common type of vegetarian, avoid meat but still consume eggs and dairy. Lacto-Vegetarians, on the other hand, eat dairy but avoid eggs, and Ovo-Vegetarians eat eggs but avoid dairy. According to The Vegetarian Society, those who choose a vegetarian diet don’t eat products or by-products of animal slaughter. This means that vegetarians continue to eat dairy and eggs as long as the animals are not killed especially if these by-products are sourced and produced under ethical conditions. In a small bowl, beat and mix the eggs, parmesan cheese, and pepper until well combined then set aside. Cook the pasta in salted boiling water, according to package instructions. Reserve 1/2 cup of the pasta water. While the pasta is cooking, add oil to the pan and saute the mushrooms. Once the mushrooms have wilted, add the garlic and thyme. Season with salt and paper and cook over medium-high heat or until brown. Once the pasta has finished cooking, add to the mushrooms and mix immediately. Take off the heat and let it cool for 1-2 minutes. Add egg mixture to pasta and toss to coat. If the sauce seems thick, add reserved pasta water. In a small bowl, whisk together soy sauce, sugar, sesame oil, and ginger. Set aside. In a large pot of boiling water, cook noodles according to package instructions. Drain well. Heat olive oil in a large skillet or wok over medium-high heat. Add garlic, bell pepper and carrots. Cook, stirring frequently, until tender, for about 3-4 minutes. Stir in snow peas and cook for about 2-3 minutes. Stir in egg noodles and soy sauce mixture, and gently toss to combine. Season with salt and pepper, if desired. Combine soy sauce, 1/4 cup water, sugar, calamansi juice, garlic, and pepper in a large bowl. Add mushrooms and mix. Set aside and allow to marinate for 5 to 10 minutes. Warm 1 tablespoon oil in a large nonstick skillet over medium-high heat. Drain mushroom tapa; reserve marinade. Cook mushrooms in batches until deep brown on both sides, stirring occasionally to allow sugar to caramelize. Transfer mushrooms to a serving dish. Add reserved marinade to the skillet and bring to a simmer. Pour marinade over mushrooms. Top tapa with fried garlic bits. Serve with garlic rice and sliced tomatoes. Veganism is the strictest form of vegetarianism and stems from the ethical standpoint that animals are sentient beings. According to The Vegan Society, apart from being a diet, veganism is a philosophy and way of living which seeks to exclude all forms of exploitation and cruelty to, animals for food, clothing or any other purpose. This means that being vegan doesn’t stop with a restrictive diet but also extends to lifestyle changes such as no longer using products that may contain beeswax, leather, wool, etc. So someone who abstains from eating animal products and by-products but continues to buy and use products with animal-derived ingredients have a plant-based diet but are not necessarily vegan. Slice one 300-gram tofu block into 1/4-inch cubes. Place in a bowl and toss with marinade ingredients. Let sit for at least 10 minutes. Slice the other 300-gram tofu block into 1/4-inch thick slabs. Rub both sides with the dry rub ingredients. Warm a thin layer of vegetable oil in a large frying pan over medium-high heat. Fry the dry rubbed tofu slabs until crispy and golden brown on both sides, about 7 minutes. Drain on a paper towel-lined dish; when cool enough to handle, chop into 1/4-inch cubes and set aside. Warm another tablespoon of oil in the same frying pan over medium-high heat. Sauté 1 diced onion, 5 minced garlic cloves, and the sili labuyo until translucent, about 5 minutes. Add the marinated tofu and bell pepper; stir-fry, mixing occasionally, until the tofu browns and the bell pepper softens about 7 minutes. Remove from heat and add the remaining 1 onion, 5 garlic cloves, fried tofu, and sauce ingredients. Mix well and serve with sliced calamansi and brown rice. Combine sweet potatoes, carrots, onions, and green beans in a large bowl. Add flour and salt; toss to coat well. Set aside. Make the tempura batter: Combine all ingredients in a medium bowl; do not over-mix. Pour batter onto vegetable mixture and toss to coat. Pour oil into a heavy-bottomed pan until 1 inch deep. Heat over medium heat. Drop coated vegetables, 2 to 3 tablespoons at a time, into the hot oil. Do not overcrowd the pan. Fry for 5 to 6 minutes, turning once or twice. Drain on a wire rack. Make the dipping sauce: Combine all ingredients in a saucepot. Bring to a boil. Remove from heat and let cool completely. Serve sauce on the side. What are the environmental benefits of being vegetarian or vegan? The livestock and dairy industry accounts for 51 percent of greenhouse gas emissions. By being vegetarian or vegan, not only are you reducing your carbon footprint but also water footprint as beef requires an estimate of 1,800 gallons of water per one pound of meat. Additionally, a significant amount of land is used to raise animals while vegetarian or vegan diets only need two and a half times less. This can also free up land to make way for lost wildlife and reduce pollutant waste that gets washed up in water. Dr. Anna M. Adora specializes in Adult Non-Invasive Cardiology at the Philippine Heart Center; Nanay Nona Andaya-Castillo is an International Board for Certified Lactation Consultant. All recipes are from Yummy.ph.